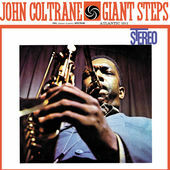 John Coltrane is certainly one of the most influential and revered Jazz Masters. Broadcast on 'Trane's 90th birth anniversary, this podcast contains music from both of his great quartets. Other than a couple of tracks that cover Coltrane tunes (Pharoah Sanders, Kenny Garrett) this podcast is all Trane. This podcast begins with tracks from cover albums from Billy Childs (Laura Nyro), Dave Stryker (70's R&B), and The Ed Polermo Big Band (Zappa). Also of note are new releases from guitarist Rale Macic and the sophomore release from young pianist Joey Alexander. A birthday tribute to Elvin Jones, the great drummer, best known for his years with the trailbrazing John Coltrane Quartet. The show covers Elvin's playing as a leader, a sideman and his work with Trane. Elvin Jones ~ Lady Luck ~ Elvin! For fans of the genre-bending Jazz Fusion, we have some interesting takes on this music. From young guitarists Rale Micic, Tom Guarna and Rez Abassi, to Fusion classic bands, Return To Forever, Weather Report and Mahavishnu Orchestra. This show finishes with a new release from Dave Stryker with some tunes you might have listened to on your eight track.